The Powder Hut is a perfect base near Mt Ruapehu. Ideal for couples, families and smaller groups. Sleeps 6 people. 2+ night bookings are preferred and a surcharge on the Summer Rates of $20.00 applies to one night bookings. Refundable deposit of $100 required on booking. Refunded within 7 days of satisfactory inspection being completed. Cosy and comfortable bach, in peaceful but central location (between Ohakune township and the Junction). - Mountain Biking /Cycling, e.g. Ohakune Old Coach Road and the famous newly restored Hapuawhenua Viaduct. - Tramping/walking (e.g. Tongariro Alpine Crossing). - Skiing and boarding on world-famous Mt Ruapehu (Turoa, Whakapapa and Tukino ski fields). Walking distance to the Junction (800 metres) - great nightlife, the Powderkeg and other restaurants, ski hire, shops. Close to Ohakune township (800 metres) for supermarket and shops. Easy drive to both the Turoa (20mins) and Whakapapa (35mins) ski fields (shuttle transportation can also be booked, enquire at Ohakune i-SITE Visitor Centre). Bath with shower, separate toilet. HEAT PUMP / AIRCON has been installed. Fully equipped kitchen with electric oven, fridge, microwave, Dulce Gusto coffee machine, sandwich press and slow cooker. Small drying rack/cupboard by entrance, washing line on the new enlarged outside deck. Outdoor furniture. Lounge area with sofa, table/chairs, bay window with seating - with views of Mt Ruapehu, great to sit and admire the view! Guests are to clean the property before leaving. If the property is not left in a satisfactory condition, appropriate cleaning charges will apply and be deducted from the cleaning/damage deposit. The property is inspected after each visit. 2+ night bookings preferred. 1 night bookings at all times incur a $20 surcharge. Additional- refundable $100 damage deposit required. Minimum 3 night bookings for Mardi Gras weekend and school holidays. english, Little bit of French. 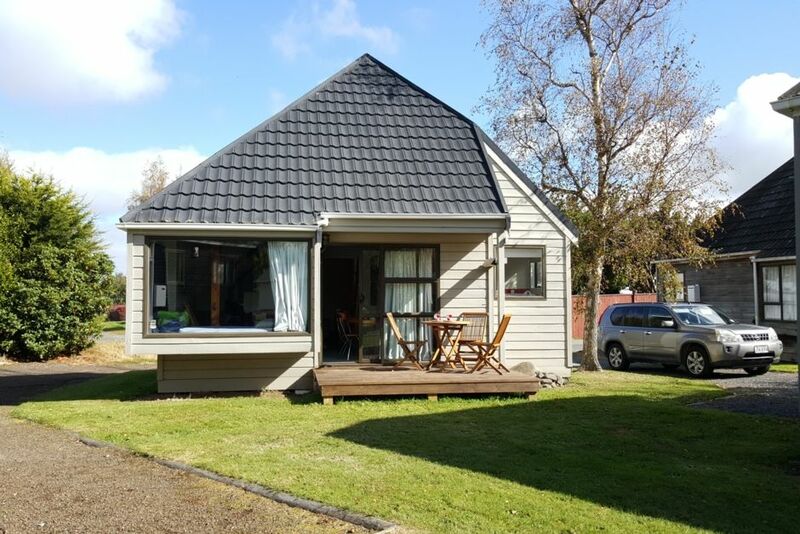 I am a school teacher and own this chalet in Ohakune which is my retreat from the busyness of work- love the walks in summer, they are varied and superb and adore the snow in the winter. I love tramping, hiking, bike riding and snowboarding- so this area is ideal! The benefits of the central plateau in both winter and summer are amazing!! You really do get the best of both worlds. Cosy, warm, good for small groups or families and as close to the mountain as you can get from Ohakune. A compact chalet with views from the lounge window and frnt deck, up to the mountain. One bathroom with bath and shower over the bath. Separate toilet. Great view of the mountian from the lounge window. Skifields are 20 mihn drive away- as close as you get from Ohakune. Plus small top freezer for longer stays. Bring your own SKY card- freview available all the time. Price quoted is for up to 6 people. Adequate for the needs of 4 adults although the lounge seating was not very comfortable for 4. Overall it was a good property but perhaps knowing the number of the Bach would have helped as it took a while to find the right one . Thank you for your feedback. You mentioned that you did not know the Bach number, it appears on the agreement you sign when you make the booking and also on the documentation that is sent to you three days before your arrival. We really enjoyed our time in the Bach. We were able to move all over the Tongariro, including a completion of the crossing. My daughter really enjoyed the rock climbing gym a short walk away. The kitchen was well equipped. My only gripe would be the kitchen sink. The two faucets are short and make it difficult to wash dishes, but this is a minor flaw on an otherwise perfect place to stay. I would recommend and stay again. We are looking forward to booking a return visit. Lovely space for a family. Everything that is needed for self catering is there. Comfy beds. Good water pressure in the shower. You can see Ruapehu from the living room window. Bliss. Centrally located for day hikes to Tongariroa National Park. Lovely to sit outside in the evening. Owner very responsive to our requests. Clean with all Required amenities. Close to town, clean and all required facilities. Accommadation was great. Everything we need was there. Only suggestion is bathroom needs external ventilation or a blind. Had some pervert looking in the bathroom window from front while my partner was showering on the morning we were leaving.